Do you absolutely hate the magic ring? Do you cringe every time a pattern or tutorial requires you start your project by using the magic ring? Have you tried and tried to master this technique and still come up short? If you’ve answered yes to any of these questions, you MUST watch my tutorial for the alternative magic ring method! I have several patterns which recommend the use of a magic ring. I have filmed detailed tutorials of how to do it. Even though I’ve taken the measures to explain the magic ring to my audience, I can’t deny the fact that not everyone will get it and even if they do, they may hate it! Here is my solution: demonstrate an alternative magic ring method. The alternative method to the magic ring gives you the same tight circle as a magic ring without all the headache. All you’ll need for the alternative magic ring method is your yarn (or scraps if your practicing), your crochet hook and a darning needle. Disclosure: Please note that the links below are affiliate links, and at no additional cost to you, I will earn a commission if you decide to purchase your supplies online. Please understand that I have experience with these products and I recommend them because I use them myself and highly recommend them, not because of the small commissions I make if you decide to buy them online. Please do not spend any money on these products unless you feel you need them. I’d love to hear what you think about the alternative magic ring method. Have you used it on projects? If so, did it stay secure? Getting input from multiple crocheters will really help us all decide if this is the right starting technique for us. Leave your experience in the comments below! Hi Brittany, Thank you for showing us this method. I have a hard time with the regular way of making the magic ring because I crochet a lot with cotton thread and I crochet very tightly, so I have a really hard time doing the magic ring. I think this way will work great. Thank you again! I’m so glad this works for you! I love this method too and use it quite often with cottons. Good method. I do have to comment on how surprised I am by your crocheting style with the spinning of your hook. Looks like it would take forever! ha ha. That’s a great idea. If you don’t mind me asking, what kind of yarn are you using there? Brilliant! I don’t have any problem doing the magic ring (after doing a whole motif blanket where each of the 250 motifs started with one, I’d say it has become second nature), but it is fussy, and its disadvantage is that does not allow you to weave in the tail (what I do is that I close the ring with the hook inside before doing the very last stitch, and then in the yarn over I take both the working end of the yarn and the tail). 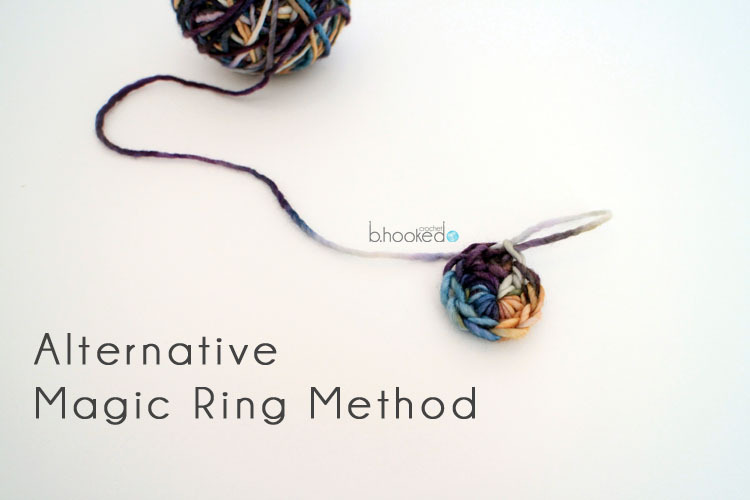 Your method is also a bit fussy in that it has the extra weaving in afterwards (taking the needle, threading it and so on), but it surely is a wonderful alternative to those who just can’t wrap their heads around the magic ring.